The DW872 currently carries the bestselling banner on Amazon. It’s, therefore, not a surprise that it tops this write-up of the best metal chop saw reviews. This is an extremely versatile unit. It has lots of cutting power for a range of ferrous and non-ferrous work pieces as the specs below point out. 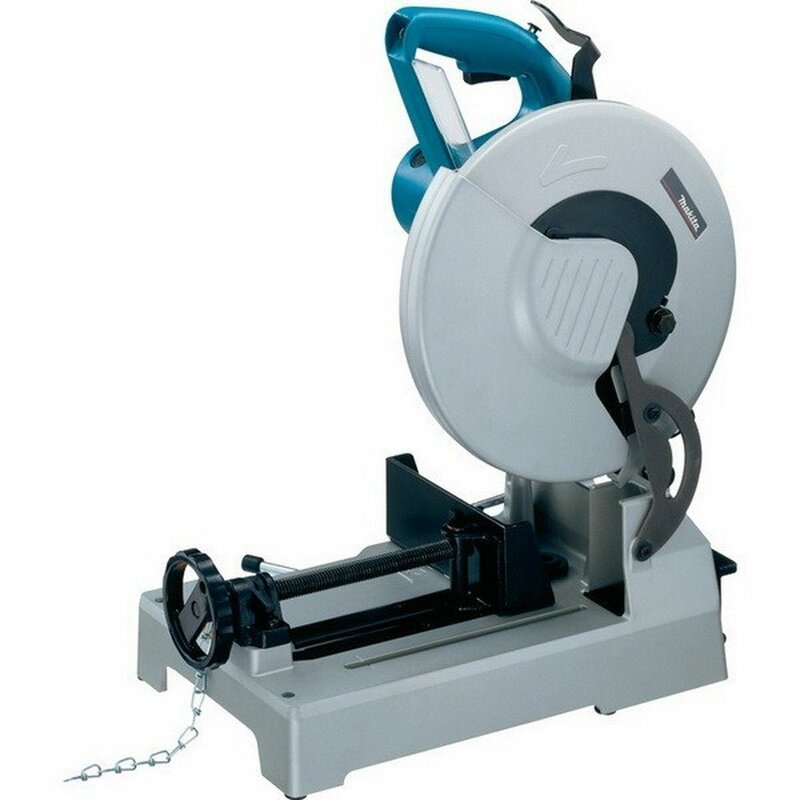 Are you looking for the best metal chop saw with true cold cuts? The DW872 could be it. While its 1300 No Load RPM isn’t the best speed on the market, it offers spark-free cool cut operations with little to no after-cut grinding requirements. This also means that both the blade and the piece you’re working on remain cool throughout the activity. Another notable feature with the blade is that its 70 teeth enable it to cut smoothly through the rods rather than grinding them. Resultantly, you’ll be using less energy in trying to push the blade through the work-piece. But this is made possible by its 15amp motor. 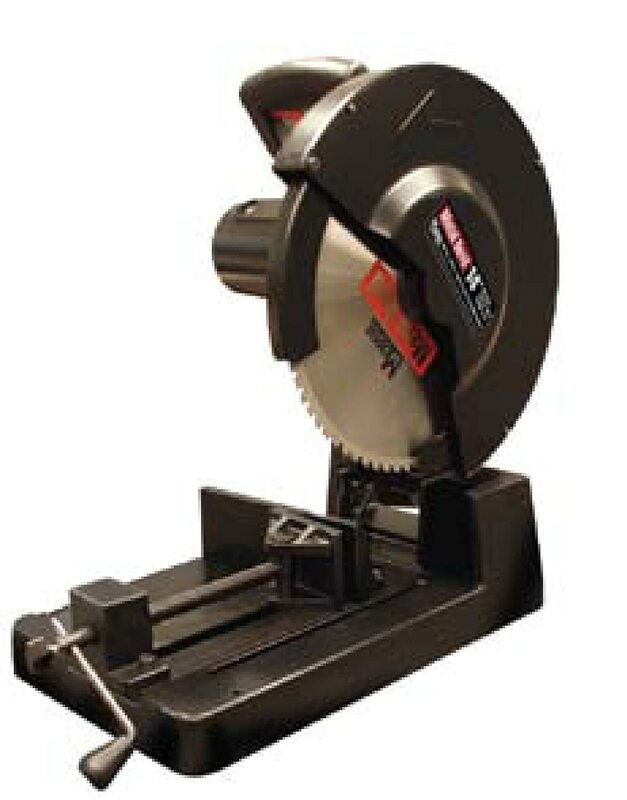 Worth mentioning, this motor has the highest horsepower in this article of the best metal chop saw reviews. This is one of those areas that the DW872 edges out its closest competitors. Besides the routine fence system, the DW872 also features a vertical clamp with a rubber padding that pushes the load downwards. This ensures that it does not make even the slightest move. A secure grip is a great deal while cutting different objects. Amazingly, this is one of the areas that Dewalt seems to do the best with this tool. Its vice features a perpendicular clamping system with a quick-lock design for instant, secure grips. A great feature here is the large but comfortable crank. It has 2 rubber grips with which you tighten down your target objects speedily and smoothly. Another worthwhile feature that we’ve seen on this metal chop saw is a spindle lock that makes wheel replacement fast and effortless. The lock is easy to lift and push back using your small finger. Again, Dewalt DW872 also offers fewer wheel changing steps which is a huge plus if you plan to use multi-blades. Other notable features with this cold metal chop saw are onboard wheel replacement wrench storage, a glass retractable blade guard, and a solid and sturdy base. Gracing the 2nd position in this list of the best metal chop saw reviews is the Makita LC1230. It comes from a brand with a huge reputation in its leading-edge power tools. Makita’s industrial strength units are known for their best-in-class engineering, safety, and customer satisfaction. The LC1230 does not shy away from this. Unlike abrasive metal cut-off saws, cold saws are known for their clean cuts. As we mentioned earlier on, cold saws don’t spray your workstation with sparks. As such, there’s very little finishing/grinding required after cutting. Cold saws like the Makita LC1230 also leave the metal cool even to touch. Therefore, you can take the freshly cut metal to the next welding stage immediately without letting it cool down. What makes the LC1230 the best cold metal saw below 400 is the amount of power that it holds within itself. Its 15amp motor rotates the blade at a slightly slower but steady speed (1300 RPM) thereby making it the best saw for thick metals. In addition to this, you get a unit with a retractable chip collector. As the name suggests, this tray catches most of the shavings thereby leaving your top clean. It also minimizes the chances of the chips interfering with the machine. The blade that ships with this metal saw is with no doubts one of the best. This is a carbide-tipped blade that should offer you years of cutting without replacement. For quick blade changes, the LC1230 features a socket wrench stored on the base. The blade doubled with the 15amp motor and a quick release vice offers you accurate cuts with virtually no burrs. This is another area that the LC1230 has excelled in. For your safety, this device features a lock-off button. Though a small addition, this feature prevents accidental start-ups that could not only cause damage but cause injuries or death at worse. Even better it has a 2-finger trigger for additional operation safety. The LC1230 is also covered by a 30-day satisfaction guarantee. You’re free to ship it back for a full refund or replacement in case it does not meet your expectations within this period. Moreover, you get a full year of free service from any Mikita Authorized Service Centers. This is the metal devil that has been giving other cheap metal chop saws a real run for their money. This machine cuts cleaner, faster and longer than most metal cheap saws on the market today. Despite its seemingly higher price, anyone who has used this metal cutting saw will tell you that it’s a worthy investment that you won’t ever regret having bought. But don’t just take my words for it. Read on and discover why the MK Morse CSM14MB is a must-have. One thing that most engineers, plumbers, electricians, and mechanical contractors like about the Morse CSM14MB is that it cuts dry. This means that you won’t be fighting crowds of sparks throughout your projects. Well. There may be some noticeable sparks here and there given the friction between the metals. However, they are significantly fewer compared to other abrasive metal chop saws. Again, they are directed away from you by the blade guard making it even better for you. Its dry-cut operations also translate to cool edges that you won’t find hard to work on when freshly cut. 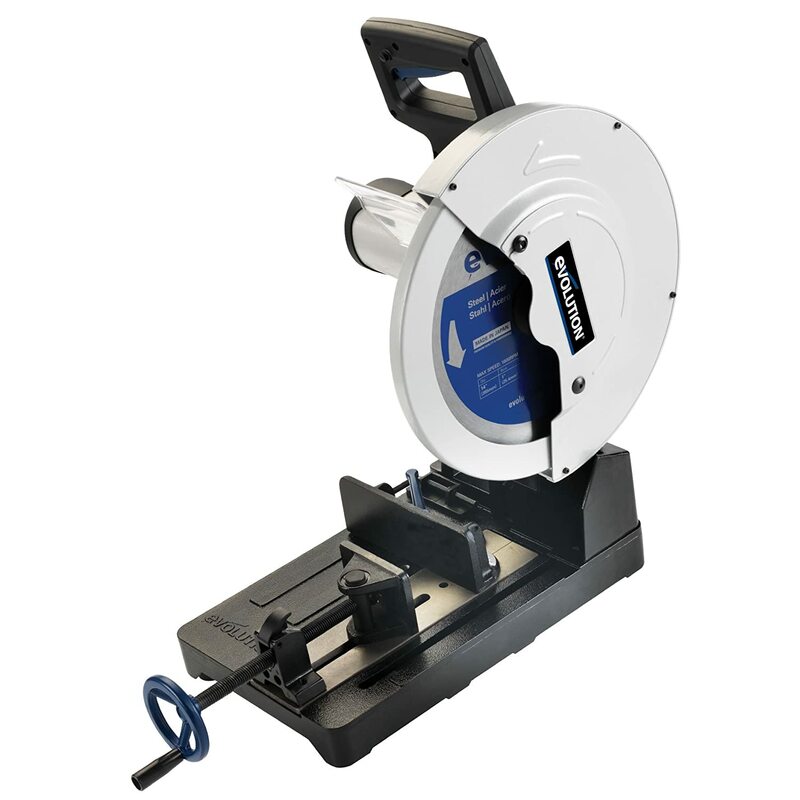 If you’re looking for a quiet metal chop saw below 500 dollars, the CSM14MB could be it. Cold saws are known for their quiet operations. However, this metal devil is amongst the best in class in that respect. What makes the CSM14MB worthy every buck is the power that it holds within its motor. But what amazes its users is how it’s able to work on metals without causing unnecessary vibrations or excessive noise. The manufacturer claims that the CSM14MB can cut through 6’’ ¼ steel metal rods in 12 seconds flat. The CSM14MB comes fitted with a 14’’ blade. Worth pointing out, this blade features a hardened inner steel plate that contributes to its industrial versatility. Its teeth have been brazed with a unique combination of tungsten and titanium carbide. So it cuts smoothly and quickly. The blade also features a retractable blade that prevents you from potential injuries. At almost half the price of the EVOSAW380 is this Dewalt D28710. 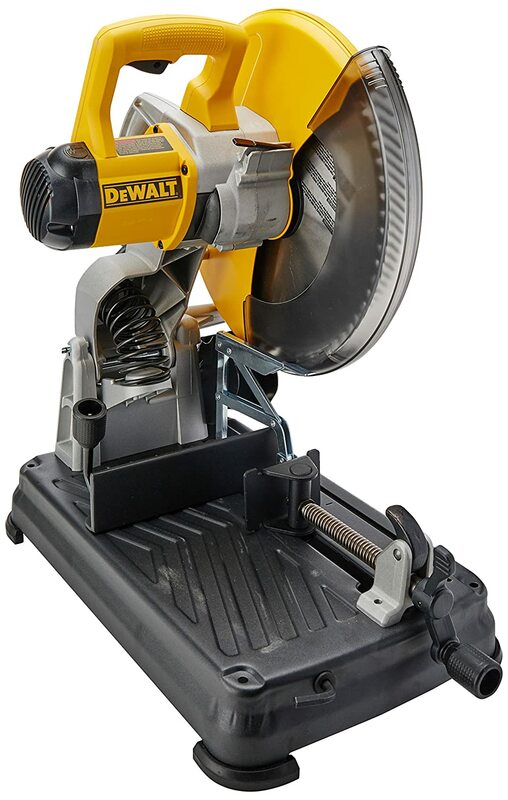 Now, there must be a reason why this Dewalt thing has been able to garner a higher rate and amazingly positive reviews from its users than the pricey EVOSAW360. Let’s find out. At a little over 150 dollars (when writing this), this is one of the best yet cheap metal chop saws on the market today. As such, if you’re looking to enjoy Dewalt Technology without breaking the bank, this could be your chance. One thing that stands out with the D28710 is that it’s meant to make your work easy and enjoyable. First off, this unit weighs 39.25 pounds only. It is way lighter than our first option and, therefore, easier to carry from site to site. Even better, this metal eater has an onboard chain that holds the head down while on transit. In addition, the D28710 has higher horsepower and almost triple EVOSAW380’s RPM. This means that you’ll be able to cut square, rectangular, round, and L-shaped metals not only fast but smoothly. Another standout feature with the D28710 is its superfast clamping and releasing system. It uses a T-handle that you only need to push forward and then turn to securely hold your metal items. Again, this clamping system has plenty of give regarding space. As such, you’ll be able to load materials of different diameters and work on them with lots of ease. It also minimizes vibrations to bearable levels. If your project requires cutting a variety of sizes, Dewalt had your needs in mind when crafting this tool. It’s fitted with a spindle lock that allows you to replace the wheel in a blink. Even better, you need not worry about forgetting your wheel change wrench again. The D28710 boasts an onboard storage for it. 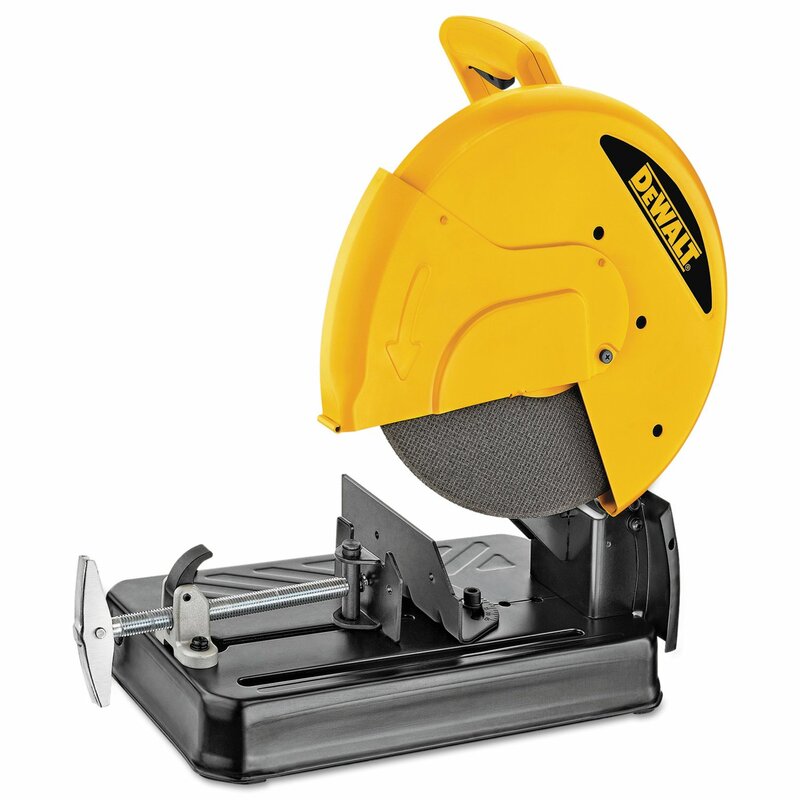 Speaking of wheels, this Dewalt D28710 metal chop saw comes fitted with a high-quality aluminum oxide grain wheel. This wheel will not only last for long but will also cut fast and smoothly. Who hates that? The EVOSAW380 is an industrial-grade cutting device measuring 21’’ x 13.5’’ x 26’’ when folded. Double this with its 55 pounds of maximum weight, and you’ll have a portable metal chop saw that you could take almost anywhere. This is made better by its saw headlock pin that holds the pivoting arm sturdily for portability. But there are lots of other high-end features that attracted our attention to this tool besides its portability feature. If you’ve tried cutting through steel with a handsaw, then you are a living example of how painstaking and hectic that could be. Handsaws not only affect your productivity but also make your projects take forever. The EVOSAW380 comes fitted with a mild steel blade. Its 1800w motor with 2.4 Horsepower gives the blade the guts to eat through almost any type of metal in your workshop. A great feature about this blade is that it offers up to 1000 cuts before asking for a replacement. Needless to say, you’ll be able to save lots of bucks that could be used to purchase other tools for your workshop. Sparks are the last thing that a welder could run from amidst their projects. However, let’s accept that there are those that won’t be comfortable working while engulfed in them. That’s why this cold metal chop saw couldn’t be more welcome. The absence of sparks in your projects also means that the metallic objects you are working on remain cool throughout the cutting process. Therefore, you can work on it with your hands immediately after slicing. Chop saws that try to shake your hand off the handle not only lead to inaccurate cuttings but could also lead to injuries. Fortunately, the EVOSAW380 has an incredibly sturdy deck, clamping system, and pivoting arm to minimize vibrations. Its 66-tooth blade is also worth noting given its smooth cuts. Notably, you could also reduce the vibrations further by using a blade with more teeth. Ships with free goodies including an extra carbon brush set, Safety Goggles, Earplugs, Hex wrench, clamping handle, and V-block. This comes first. The depth of your cuts depends on the size of the blade. Most metal chop saws ship with 8’’, 10’’, 12’’, and 14’’ blades. Needless to mention, wide items will require wide blades. Vice versa is true. On this note, it’s important to consider the types of blade that each unit comes with or accommodates. This will determine the size of metals you can work on. Multi-purpose blades make working on different types of metal easy. They, therefore, save you all the hassle and time spent on changing the blades. In addition, consider the maximum cutting capacity that the blade offers you. It’s also important to understand how flexible in terms of cutting bevels the saw can be. Typically, most metal chop saws have a beveling shoe that offers 450 and 900 cutting angle options. Several heavy-duty blades will cut through different types of materials without a hitch. However, there also exists some that will withstand one type of metal and not the other one. This makes interchanging them necessary. As such, you need a unit that you won’t spend all your time on this. If you plan to carry the metal chop saw from place to place, then this is a factor that you won’t want to overlook. Tradesmen who move about with their tools of work will prefer a lightweight unit that has been designed for the road. Besides being light, the cut off saw also needs to have convenient carrying handles. On this note too, consider going for a tool with a tank-like construction. You don’t want to lose it to a few bumps as you move it around, do you? Needless to say, eating through metal will cause a whole lot of vibrations. Considering that metal chop saws utilize a spring that pushes the arm up as you pull it down, you’ll certainly need a handle that won’t work against your hand. This not only makes your work easy but also adds to your safety. Typically, a metal chop saw with a horizontal ergonomically designed handle will be more comfortable than a vertical one. A common way of making precise cuts on your metal is by making marks on the exact point where the blade should grind. Fortunately, some abrasive saws are fitted with a bright laser light. While this light is ideally meant to make accurate cutting possible, it also makes it easy and safe for you to work in low-light areas. Does the speed of the motor matter? Motors with high rotation speeds result to higher RPMs. High-speed blades offer you fast cuts and greater control in your projects. On the downside, motors that give up to 3800 rpm also cause lots of sparks. This causes heat build up on the blade plate and the metal that you’re working on. Resultantly, you’ll have to grind it further to give it a smooth finish after cutting. It’s advisable to go for a unit with a strong motor that has low speeds. These cause little to no sparks and the freshly cut metals are cool to hold. Worth mentioning, don’t always take the manufacturers’ or product reviewers’ word for it. You need to consider what other users have to say about the unit. So that’s it for today. If you’re looking for the best price metal chop saw, this list of the 5 best metal chop saw reviews would ultimately save you all the time and hassle of comparing different units. In case you feel overwhelmed on what cut off saw to go with, the Dewalt D28710 is a great choice if you’re looking for a cheap metal chop saw. However, if you feel that you have enough to spend on the best metal-cutting technologies, the metal devil CSM14MB, Makita LC1230, and Dewalt DW872 lead on any list of the best metal chop saw reviews.